A taper which is basically trimming the hair around the ears and at the back is the foundation of any good haircut. A properly done taper can give you that classic man look that Jidenna made, well classic. The taper fade or fade as it is commonly known is one of the hottest cuts of the year and it just keeps getting bigger with celebrities like Idris Elba, Usher and Will Smith rocking the look left, right and center. The most important thing to learn on how to give a taper is to blend the cut for a smooth finish and to ensure that the haircut looks natural. There are different kinds of taper fade haircuts with the main ones being: a regular, high, low or a high-low fade. The high top fade like Usher’s hair cut also called the South of France is another type of taper fade to try or the temple fade which is a classic Drake look and is perfect for guys with short hair or with a slight afro going like August Alsina. The cut has become such a hit with guys all over the world and especially the black community because it is easy to maintain and it can be manipulated to fit your own style. It also combines an old-school look with a new school modification that results in a neat, clean classy look. 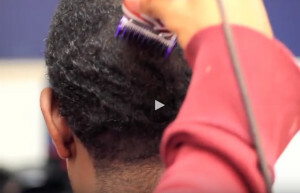 This video shows how to give a taper, a basic taper is done and the end result. The basic steps on how to give a taper include using the right clippers, starting at the base line which is where the blending will start, setting the clippers to the desired length then cutting the sides and back of the hair to establish a taper and then readjusting the clippers and cutting upwards. The best part about this cut is that there are no specifics when it comes to the length on the top and one can get as creative as they want.